Bluesy american psychedelic rock from 2001. A lot of people compare this to Hendrix. 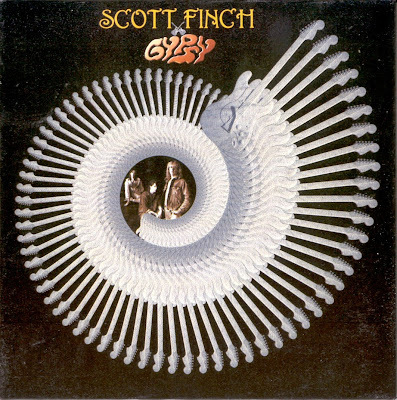 Scott Finch & Gypsy got together in Wisconsin back in the eighties to form a compelling and authoritative trio that reawakened our senses and re-ignited our interest in that important period of rock music. Scott Finch (guitar, vocals), Joe Steil (bass, vocals) and Gregg Slavik (drums, percussion, vocals), are an original blues-rock power trio that ingeniously construct their own identity and style. Finch plays and sounds like Jimi often enough during the course of this larger-than-life release that you may find yourself thinking that it's actually the man himself back from the grave for one more jam session. They readily summon images of the master at several points during the course of the entire 76 minutes found on this generous rock excursion. In its entirety, this music is like watching several points of light coming together to create a supernova. Finch mentions in the liner notes that musical nirvana is the ultimate goal that the group strives to achieve. I think it's safe to say that musical nirvana is obtainable.